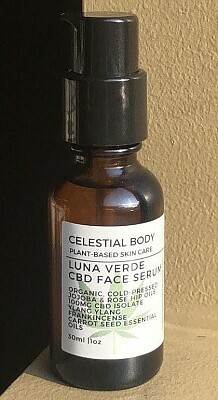 una Verde CBD face serum is nothing short of pure joy for your face. Use all day, everyday. Best if applied to clean, dry face, but anytime is fine. It is counter-intuitive with oil re-production-it does not make your face more oily. In fact, it helps to control sebum reproduction and best mimics skins natural balance of oil. JOJOBA and ROSEHIP oils blend with the CBD to provide soothing, healing feel and add elasticity to your skin. CBD is at 100mg isolate. From signs of aging to acne, it works to hydrate, heal, and treat a myriad of skin conditions. Since it’s sourced from hemp, CBD oil is naturally rich in vitamins A, C, D, and E. Each of these micronutrients provides skin with the nourishment needed to sustain healthy skin. Vitamins C and E are well-known as powerful antioxidants. Vitamins A and D are required to maintain moisture, repair skin cells, and minimize breakouts. Essential oils of ylang ylang, frankincense and carrot seed are face-friendly and light, for maximum benefit and a nice blend of aromatherapy.